“S.H.E” stands for Seeking His Ear. As a wife, it’s important to take time with the Father. Sending your prayers, praise and worship to His ear on behalf of your marriage and others. Calling all wives to join us on June 29-30, 2018 for a time of learning and growing. Registration opens Friday, March 23, 2018. There are limited early bird specials!!! So don’t delay, register early! 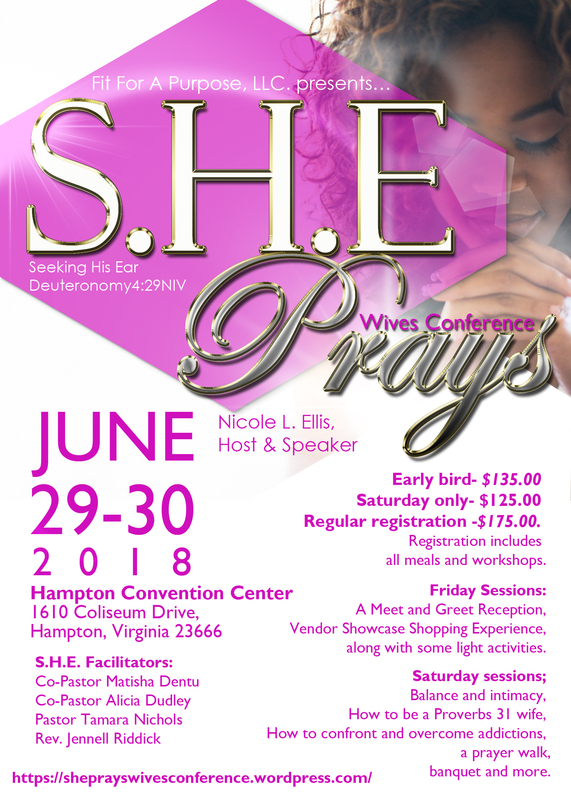 To the husbands: be a blessing to your wife and gift her this conference. To the wives: make this a girls weekend and invite your friends. To everyone: be a blessing to your mother, grandmother, aunt, sister and more. This promises to be a life changing weekend with phenomenal speakers.